Payers are stretched between higher costs of delivery and lower citizen willingness to pay. Health startups must consider the role of payers and reimbursement models from day one in their quest to extract value, says Dominic Pride. On September 8, Upstart founder and chief instigator Dominic Pride dropped into London's digital health co-working space Health Foundry to host a "lunch and learn” session. The key topic was how start-ups can think about the dynamics of healthcare payers, and how to involve them in their product, marketing and business model, and crucially to identify how to be reimbursed. He also offered perspectives on other healthcare landscapes and how health is funded outside of the U.K.’s NHS. Below is a wrap-up of key points and some of the sketches made during the talk. First let’s talk about who the payers are first. it’s only been in the last decade that a clearer distinction in the UK has been drawn between commissioners and providers, something sharpened by the Health and Social Care Act in 2011. In other markets, where care is funded by mutual societies or private insurers, the distinction is clearer. While many startups rightly focus on problems faced by patients and caregivers, payers are a vital and often overlooked part of the health ecosystem. Let’s put them in focus and find out what make them tick. Dominic Pride at Health Foundry Lunch and Learn 8 September. 1. Payers are Stretched. Whatever the market, Healthcare payers are stretched. Health costs are tracking ever upwards, driven by increasing costs of delivering high-tech care, demographics, the burden of chronic diseases and changing consumer expectations. Meanwhile, the public propensity to pay is at best flat, and in some instances declining as proportion of overall income. Where care is funded publicly, any government standing for election on the promise of increased taxation for health and care is effectively signing a suicide note. Meanwhile private insurers are also struggling with customers churning off health policies rather than confront the true cost of health care. As the cost curve tracks up and the revenue curve flatlines or tracks down, health payers are in the challenging position of having to do more with less budget. Populations are showing unwilling to pay the true cost of healthcare, whether through increased taxation, higher premiums or workplace deductions. Meanwhile the cost of treatment is tracking higher in developed nations due to demographics, consumer expectations and more advanced treatments. 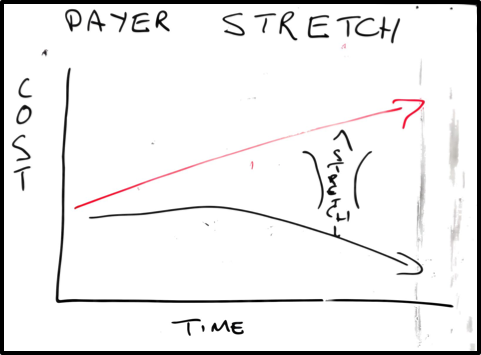 All payers are stretched between the two diverging trends. In the UK, healthcare is struggling with a £30 billion shortfall. In the US, successive governments have been wrestling with the challenge of how to fund spiralling health costs, which run to 14% of that nation's GDP. At a high-level, these two radically different payer landscapes are facing the same challenge. As audience was more than familiar with the UK’s NHS For this talk, we focused on private and mutual funders of healthcare and on insights from other markets. Irrespective of the funding methods, the challenges and dynamics of payers are broadly the same. The mechanics may differ, but all payers - public, private and mutual - collect money from populations, then pay providers to deliver care. In the US and Europe, employers are becoming an increasingly important source of funding care and are looking at prevention in the chronic disease space. 2. Digital Can Play a Huge Role. Until now, more technology has usually meant higher cost. The rising risks and costs of developing and commercialising drugs and the increasing complexity of medical devices has inevitably driven the cost of delivering healthcare higher. We may be close to an inflection point, where digital technologies have the potential to actually lower health costs. The same forces which have disrupted media, telecoms, finance and retail are now being unleashed on healthcare. The net result is the potential for reducing reliance on increasingly rarer and costly skilled humans within health systems. It also opens up the possibility of identifying and managing risk on a granular individual basis rather than the traditional cohorts used by Insurance industry. Let’s look at that in more detail. 3. Insurers are *Just* Getting Round to Dealing With Risk. Insurance-led players are now embracing digital and driving a number of digital innovation and transformation initiatives. Yet their priorities at the moment are yet not directed at scale towards using digital to address risk. A landmark report in 2015 from KPMG showed that wearables and IOT were a priority for only 6% of Industry leaders surveyed, whereas improving operational processes are a priority for 60%. As massive claims processing factories. 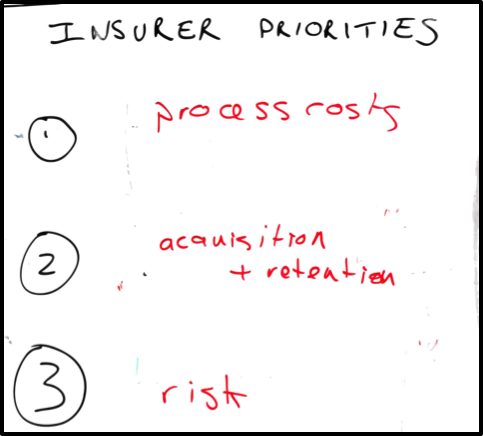 insurers are following the money and working on some of their the biggest costs and immediately solvable problems. Even a small gain on the efficiency of collecting and distribution payments can deliver significant cost savings. Second in line for digital to play a role are the costs of customer acquisition and retention. The focus on innovating around customer experience is an indicator of how insurers are helping to lock in customers and prevent churn, so they can achieve greater customer lifetime value from those they pay to acquire. Risk is currently a distant third. Insurers such as Aviva are experimenting with reduction on premiums for safe driving with the Aviva Drive app. However the tracking and monitoring needed to apply the same logic to health behaviours will require very significant intrusion into customers' lives and spark enormous privacy debates. Insurers have been using digital to reduce costs in collections and processing, then moved onto customer experience to make sure their acquisition and retention budgets are effective. Only now is digital coming into focus to be able to more effectively manage risk. 4. Value-based Care Will Drive Digital Adoption. A global trend across payers and providers is the move towards a value-driven care. There is a move away from traditional fee-for-service basis, based on price and volume, towards one driven by better quality health outcomes. This will deepen partnerships and drive the need to have the payer embedded more deeply into the health delivery landscape, whether they are funding care on a universal model, on a mutual model or the funds come from a private insurer. This focus on outcomes will lead to some new business models being generated. Players will be looking for better long-term outcomes for the same price, or the same outcomes for a cheaper price. Quality metrics which flow through and between organisations can become evermore nuanced and granular. 5. Business Models do Not Equate Reimbursement Models. Bringing digital to healthcare can help to drive cost savings. Empowering patients to take better decisions, solving a problem for a health professional can all save money. A cost saving may create value. But, this value needs to be captured and extracted if there is to be a workable business model. The way the product or service formula is presented needs to be thought through and mapped to the way that payers will pay for it. Crucially, there needs to be a clear reimbursement model in mind. Two good examples of reimbursement models are WideCells and Ieso Digital Health. Wide Cells CEO Joao Andrade explains the company's ecosystem model for developing their market at HealthTechXEurope. WideCells provides support services for providers who are delivering Stem Cell Therapy. They created the conditions for adoption by creating an insurance policy model to enable consumers to insure against the cost of therapy. Ieso recognised that UK primary care was able to prescribe and reimburse CBT and provided an effective digital solution for this. Crucially, a tariff already existed which could fund the product from launch. The IHI Triple Aim focuses on better care, helping HCPs deliver better health for populations and reducing cost for payers. Health startups need to consider all aspects to ensure they fit in with health systems. All too often startups are focused on the top two and focus on the payer last. 3) Success will depend on value extraction and relevant business models, but crucially reimbursement models.